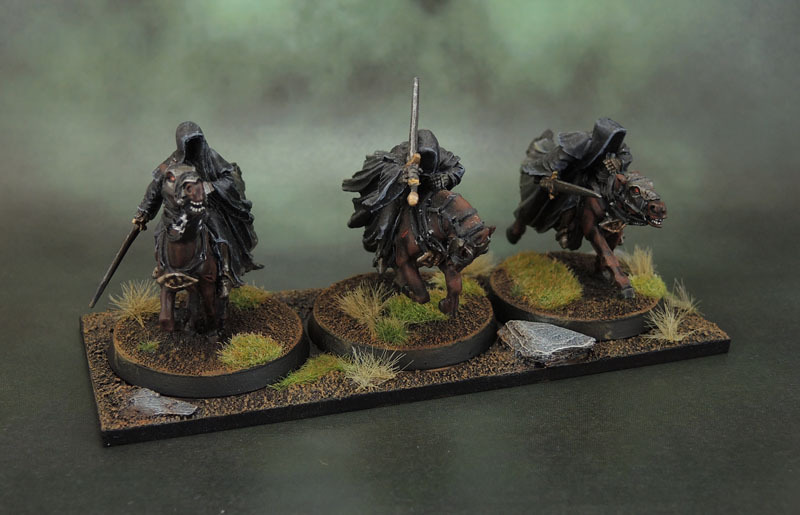 Three of Nine – Citadel Miniatures Mounted Nazgûl | Azazel's Bitz Box. These three models were painted some time ago, around 2005 – give or take a few years, and long before blogging was a thing to me. 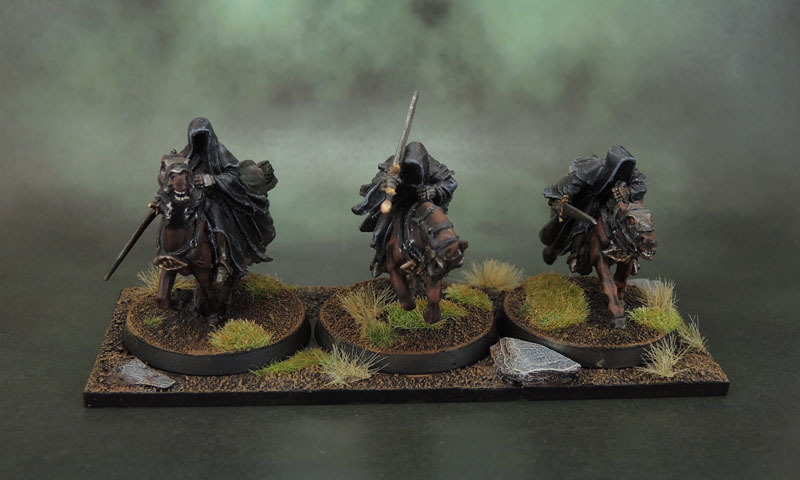 They’ve recently been drafted into Marouda’s Kings of War Undead force as Soul Reaver Cavalry – that is to say Vampiric Cavalry, which seems about as reasonable an approximation of Nazgûl as you can get within the Army list. These three represent a “troop” of Vampire Knights, which would ordinarily be made of 5 models. Works well enough for me! So while the models are old, and their paint is old, what’s new is that I’ve gotten some custom-cut MDF and been able to make a unit base for them, in much the same way as I did with the Swarms that I painted recently. I think it makes them look quite nice, and certainly looks better than having them blu-taced down to a bare piece of MDF. I don’t believe I’ve shown these models before, so it’s all good. 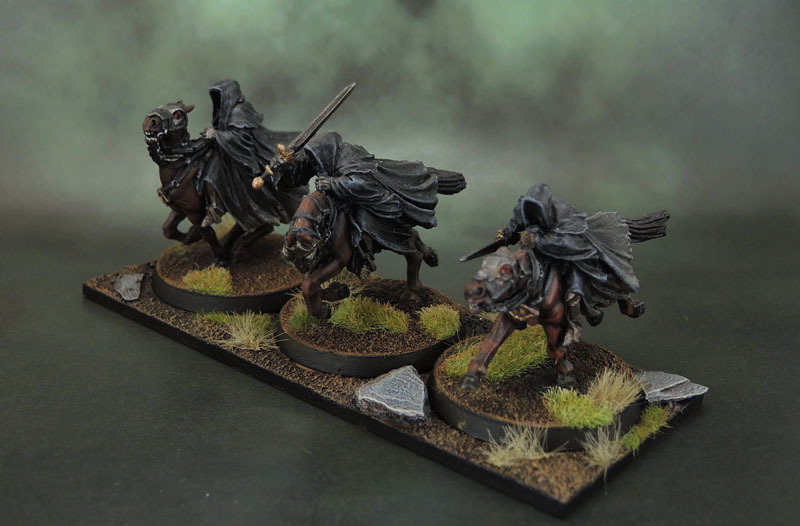 For now, the Nazgûl will reside in the Undead Army, but at some stage they’ll be split off into their own Mordor force – When I have enough Mordor models painted to field them as a smallish army in their own right. This entry was posted in Kings of War, Lord of the Rings, Mordor, Undead Army, Vampire Counts and tagged Black Riders, Citadel Nazgul, Dark Riders, Lord of the Rings, LotR SBG, Nazgûl, Strategy Battle Game, War of the Ring. Bookmark the permalink. Nice. Hey woth the high lighting on the robes did you dry brush? Yep, these three are entirely drybrushed. The final layer is brushed with bone on the lower hems of the robes to give a dusty effect. Nice painting and a well-chosen backdrop too, suitably moody! Thanks! The deep green seems to work well for “bad guys” and so is getting a lot of use lately. The blacks are very good indeed. Nice variation while not just looking grey. What colours did you use? Are the bases atatched via magnets or is there a slot under the base? They would be black, with layered drybrushing through mixes of Vallejo MC Black Grey through to Wolf Grey which is a blue-grey and then very subtle Snakebite Leather/VGC Leather Brown and finally Bone for the robe hems. They’re attached to the base with a simple little blob of blu-tac. Since the models are all reasonably heavy due to being metal, the blu-tac holds as well as magnets would have, and it much simpler to apply. Either way you wouldn’t want to lift the base via one of the models. Pingback: The Black Rider – Citadel Miniatures Mounted Witch King of Angmar | Azazel's Bitz Box. 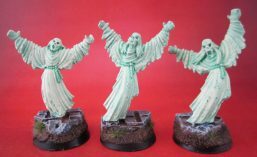 Pingback: The Fellowship of the Ring Scenario Project Pt1: Five of The Nine – Nazgûl on Foot (June-It ’18) | Azazel's Bitz Box.